Since 2005 I have visited South Korea several times and travelled extensively there, visiting in all seasons. In fact, I’ve lost count how many times I’ve travelled between Seoul and Busan by both rail and road (it’s quite a few!). Korea is a beautiful country. It is known as the “land of the morning calm” – and it’s true, there is something very special about the light there. I’ve seen some beautiful sunrises (as well as some wonderful sunsets too). On a recent trip in 2010, whilst staying in Seoul, I went for a wander through Insa Dong which is characterised by handicraft and antique shops, as well as traditional tea houses and restaurants. It’s well worth rummaging around here in the curio shops as there are plenty of interesting finds to be had, and I’ve been lucky enough to pick up a few bargains too. But today, for the second in my ‘Souvenir Series’ of posts, I thought I’d write about my miniature onggi. I bought this from a small shop which specialises in this particular kind of traditional Korean ceramic. This is a characteristic type of earthenware which has been produced in Korea for centuries. Most famously these are the large storage vessels in which kimchi is made and ripened. This type of earthenware is perfectly suited for the fermentation process needed to create good kimchi. It is porous and yet also waterproof when glazed, meaning that air can pass through it whereas water cannot, hence the onggi are able to “draw breath,” and this is essential to the fermentation process. Onggi are a familiar sight throughout Korea. The jars are usually about the size of a small barrel with a dish-like lid. They are often buried, half-submerged in the ground in order to maintain a steady temperature. Characteristically they are a reddish or chocolate brown ware with a distinctive shape; often plain but with a particular, textured patina, they can sometimes be decorated with understated patterns too. They are thrown on a wheel and are built up quite quickly from coils of clay which have been carefully and laboriously pounded and rolled beforehand. The following films were made by an American potter called Adam Field who has studied how to make onggi in Korea. The first two films show Kim Young-Ho, a sixth generation onggipotter at work, and the third is a time-lapse sequence of Adam Field, each making an onggi vessel in the traditional manner. You can see more films of the kilns and firing process, etc on Adam’s YouTube channel. My miniature onggi is 10 cms (4 inches) tall, the lid being around 3.5 cms (1¼ inches), so about 12 cms (4¾ inches) when put together; with a diameter of roughly 10.5 cms (4¼ inches) at its widest extent. 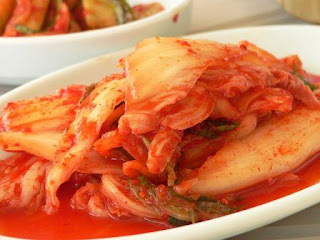 And, whilst I do like kimchi (particularly cucumber kimchi), rather boringly I use mine for storing sugar!